At the Danish Air Ambulance base in Billund, satellite navigation is a true lifesaver in the sky. The air ambulance service, operated by the Norwegian Air Ambulance in Denmark, is among the first to use a new European satellite system, EGNOS, that makes it safer to fly in low visibility. Before the service started using EGNOS, around 10 percent of missions had to be cancelled due to bad weather – 300 incidents a year in Denmark alone. “If we didn’t have a satellite signal, we weren’t able to bring a patient to the hospital, and therefore the patient wouldn’t get the best treatment. For the person who gets the pre-hospital care and is flown to the hospital, it’s a matter of life and death,” says Christiansen. EGNOS provides accurate positioning, vertical as well as horizontal, so the pilot can rely less on visual clues and more on the instruments. That makes it less of a problem if the ground is obscured by fog or clouds. The system is based on geostationary satellites and a network of ground stations that constantly correct the GPS signals, which on their own can miss user’s position by as much as five metres. These corrections are then relayed in real time to the EGNOS receivers in helicopters, planes, sea or land vehicles. EGNOS positioning data is free to use to anyone equipped with the receiver. 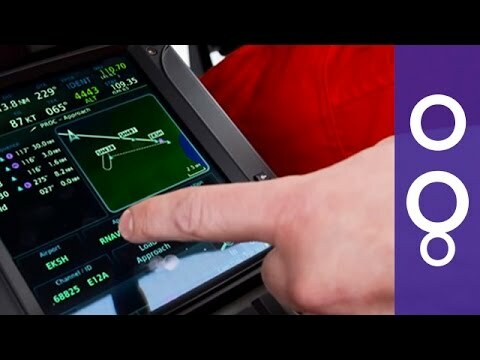 Pilots just need the approach procedures for various landing spots, which are developed by air traffic authorities and stored in the on-board computers. “Of course, there are costs involved in establishing the procedures, but as far as I’m concerned we don’t have any costs associated with using EGNOS.” says Christiansen. Passenger planes can take advantage of this satellite system to safely land at airports not equipped with ILS – the instrument landing system which uses costly radio-based equipment on the ground. EGNOS is a joint project of the European Space Agency (ESA), the European Commission, and the Eurocontrol agency that tests air traffic innovations. “What’s interesting with satellite navigation, and with EGNOS, is it can replace some means of approach needed at airports. So we can make savings at airports in terms local infrastructure,” explains Aline Troadec, a satellite navigation expert at Eurocontrol. “EGNOS can provide a more efficient service than we had in the past, including improving access to certain airports in adverse weather conditions – so, better punctuality, fewer delays, less diversions to alternative airports,” Troadec continues. So far, less than 10 percent of all flight crews in Europe say they are set up to use EGNOS. The Swiss Air-Rescue service flies over 11,000 helicopter missions a year. It has equipped all its copters with the new technology and trains all its pilots to use it, anticipating a nationwide adoption of EGNOS. Hospitals in Switzerland are to be made accessible for EGNOS-guided approaches. Victims of skiing accidents, for example, will be able to help quickly – even if there’s thick cloud like in this simulation. “We did a lot of test flights – we have a collaboration with the Swiss Air Force, and we have installed in several helicopters from Rega and from Swiss Air Force a tool that was calculating the precision and the reliability of the GPS and the EGNOS system. And for our purpose it’s accurate and reliable enough,” Gnagi says. EGNOS can be used alongside GPS (the US global positioning system) and Galileo, Europe’s global positioning system. Above all, the wider use of EGNOS will lead to more lives being saved.